Forget about ephedra. We DON’T use it in any of our products, period! If you want to lose weight the safe and natural way, you want the powerful combination of all-natural pyruvate and green tea extract. These proven ingredients will get you the slimming results you want, without jittery side effects. Get Your Best Possible Results— Or Your Money Back! Take Slimming Formula and know you’re losing more weight, burning more fat, and getting your best results possible—we guarantee it! If you’re not satisfied with the performance of this product, just return it within 30 days for a full refund of the purchase price, less shipping and handling. 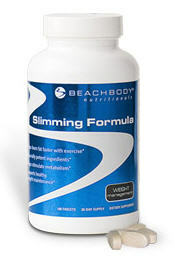 †In a nonclinical Beachbody® test group, those who used Slimming Formula along with their Beachbody program lost an average of 29% more body fat.